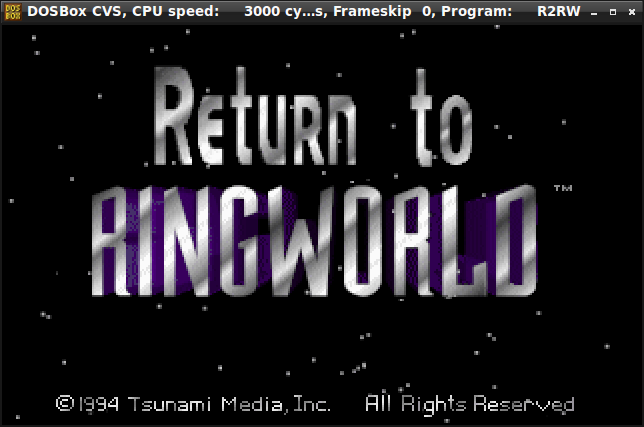 As indicated in my previous post, the Translator has expressed interest in applying his hobby towards another DOS adventure game from the mid 1990s: Return to Ringworld (henceforth R2RW) by Tsunami Media. This represents significantly more work than the previous outing, Phantasmagoria. I have been largely successful thus far in crafting translation tools. I have pushed the fruits of these labors to a Github repository named improved-spoon (named using Github’s random name generator because I wanted something more interesting than ‘game-hacking-tools’). Further, I have recorded everything I have learned about the game’s resource format (named RLB) at the XentaxWiki. The previous project mostly involved scribbling subtitle text on an endless series of video files by leveraging a separate software library which took care of rendering fonts. In contrast, R2RW has at least 30k words of English text contained in various blocks which require translation. Further, the game encodes its own fonts (9 of them) which stubbornly refuse to be useful for rendering text in nearly any other language. I have been assisting The Translator in the translation of another mid-1990s adventure game. This one isn’t quite as multimedia-heavy as the last title, and the challenges are a bit different. I wanted to compose this post in order to describe my thought process and mental model in approaching this problem. Hopefully, this will help some others understand my approach since what I’m doing here often appears as magic to some of my correspondents. At the highest level, it is valuable to understand the code and the data at play. 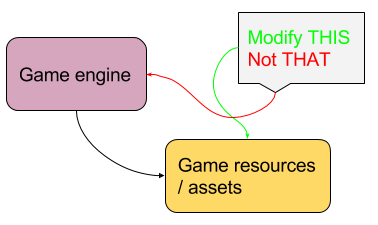 The code is the game’s engine and the data refers to the collection of resources that comprise the game’s graphics, sound, text, and other assets. Ideally, we want to change the data in such a way that the original game engine adopts it as its own because it has the same format as the original data. It is very undesirable to have to modify the binary engine executable in any way. How to modify the data? If we modify the text strings for the sake of language translation, one approach might be to search for strings within the game data files and change them directly. This model assumes that the text strings are stored in a plain, uncompressed format. Some games might store these strings in a text format which can be easily edited with any text editor. Other games will store them as binary data.